Are timestop switches used in this episode? I'd love to see some puzzles with those. I doubt it, but it gets REALLY hard after a certain point. Various gimmicks exist, like disabled controls, reversed controls, et cetera. @Reign: Personally, I really like this episode. I have been playing it for two days now. Great work, and I look forward to your next episode! Thank you for telling Яeverse Controls are in the episode. I never got that fa r in the beta. There are no time stop gimmicks this time, there were a few in the original and I decided not to add more of them here. The minibosses are a part of the level. The "level" before them is always shorter than a regular level. The big bosses have their own level. 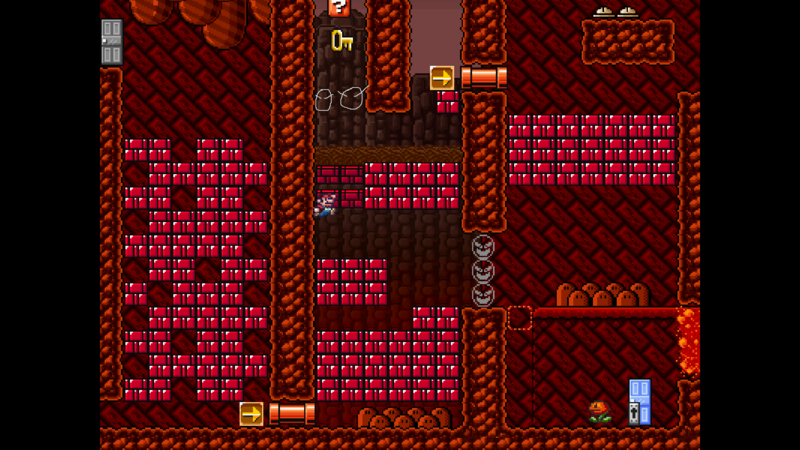 The levels with two screens are considered one level. Big bosses do not count as levels. Thanks a lot for the feedback, appreciate it. On Airlocks, there is a problem with the air meter. It isn't set to not be active in pipes. I died while in the pipe. I just wanted to point this out. Thanks! Jayce 777 wrote: On Airlocks, there is a problem with the air meter. It isn't set to not be active in pipes. I died while in the pipe. I just wanted to point this out. Thanks! That did not happen in the internal testing. Is it in all Airlocks levels or just a particular one? EDIT: If you mean you died while "warping", that is actually intended. It's just the way the API works and the level was designed around that. You should still have enough time to complete the levels. I found a mistake a while ago before the internet crashed. The squared exit warp is facing the wrong direction (down instead of up). Can you fix that? Thanks, will fix that. You actually don't even need to use the warp to go upwards so I'm probably going to remove it altogether. Right now you don't have to throw the key up because you can just hit the block with a normal run -> jump. Added two masks to level 48, that is good suggestion. Level 410, that is an oversight on my part, I fixed that part after the beta and did not realize you can now just leave the starting point without using the bomb. Will be fixed, a new version will be uploaded in a few days. Those arrow platform gfx appeared in SMB3, and I think they fit just nice! A version where the three changes suggested above were implemented has been uploaded. None of the bugs were gamebreaking so there's no reason to start over if you have the old version. I'm stuck at Oubliette 1 and Incineration 1. The second level of Oubliette 1, I can't transport the key through the pipe that points upwards (and what's also weird, I tried to trap the right thwomp by quickly activating the light-blue switch, but for some weird reason, the thwomp goes through the switch blocks as if they didn't exist!) Is this also a bug that's not fixed yet? After that I tried Incineration, and there's another level where it's even pretty obvious that a key needs to be transported through a pipe, and it fails. I'll start working on a solution video this weekend. You can NEVER carry keys or any other npcs through pipes. There's always something else that allows you to solve those puzzles. You can jump through and throw NPCs through the narrow green bridges. You don't have to use the pipe to get up. I actually removed the upwards going warp in the fixed version to avoid confusion. The way the thwomp works is just the way it works with SMBX. You can not block its way when it's going upwards. 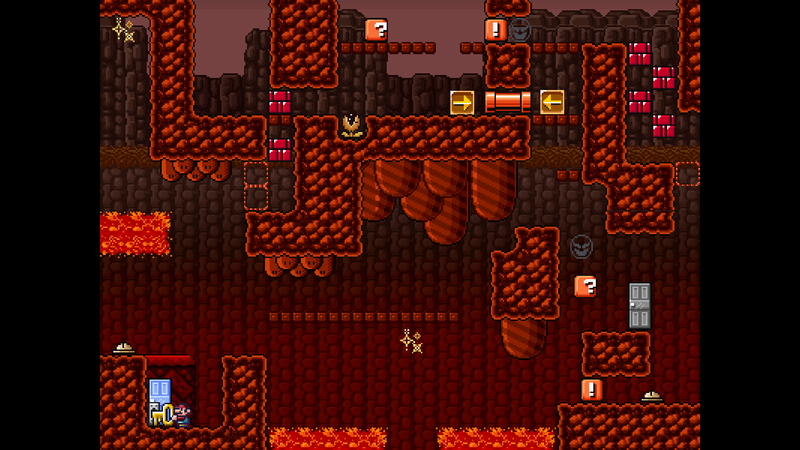 Since I don't know which level in Incineration it is, it's harder to give you a solution. But it could very well be the same case there, NPCs can be thrown through the bridges. Well, I should really have seen this at least in Incineration. I was honestly confused because I thought that in the intro it was stated that you could carry objects through pipes, but it's the opposite. Nevertheless my bad, heh. Stuck again in the fourth level of intimidation 1. Any tips? Cant seem to get the blue switch in the right position to get to the door. alwahla wrote: Stuck again in the fourth level of intimidation 1. Any tips? Cant seem to get the blue switch in the right position to get to the door. If you show a picture, then I can help, as I got to Culmination 1. I uploaded a video, hope it's the level you mean. Jayce 777 wrote: If you show a picture, then I can help, as I got to Culmination 1. Congrats! I feared some of the levels in Shuddering or Intimidation might be too difficult but clearly that is not the case.